The theme was all white. 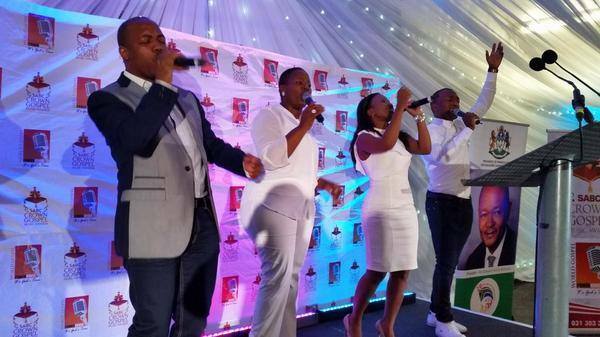 And indeed, the guests came out to play looking elegant at the 7th SABC Crown Gospel Music Awards nomination party in Durban on Friday. The awards are the brainchild of Zanele Mbokazi who’s well-known for her motivational seminars and also is the founder of World Gospel Powerhouse which organises the Crown Awards. It was revealed that this year’s entries went up to 502. The awards have 33 categories, seven of which are open for public voting. Founder, Zanele explained that quality and diversity of these awards is amazing. “This year we have confirmed that gospel music is extremely rich and there are a number of talented and professional artists that are still not well known. I am in awe of the craft that we have received,” she said thanking those who’ve sent through their entries. “Whether they are nominated or not, they all remain winners," she added. The seven categories which will be voted by the public includes the Best Gospel Artist, Best Gospel Song, Best AmaZioni, Best Gospel Maskandi’ Best Gospel Radio Show, Best Gospel Community Radio Show and Best Gospel TV Show. The main event will be held at Durban’s ICC and will be broadcast live on SABC1 from 8pm. Tickets are R350 to R630. The VIP ticket, which includes limo ride, red carpet and after-party cocktail costs R855.